Shigehisa Takada: "I feel sorry our products hurt customers, despite the fact that we are a supplier of safety products." TOKYO (Bloomberg) -- Takata Corp. President Shigehisa Takada made a public apology for the eight deaths and hundreds of injuries related to the company’s airbags dating back more than a decade. 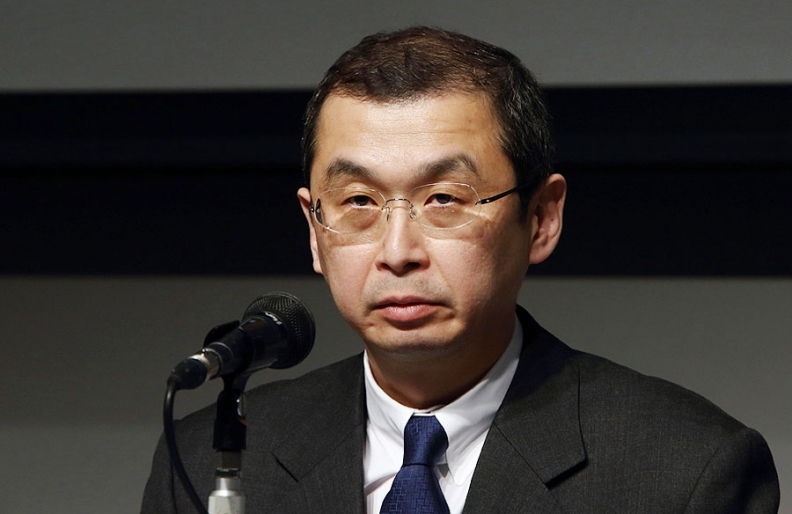 Takada, 49, bowed and apologized at a press briefing in Tokyo after the company’s annual shareholders meeting today. He said the safety components supplier is considering ways to help victims, including by setting up a fund to compensate them. Takada has previously apologized in written statements and print advertisements in U.S. newspapers. The grandson of the Japanese company’s founder spoke hours after Toyota Motor Corp. and Nissan Motor Co., two of Takata’s biggest customers, recalled another 3 million vehicles with airbags produced by the supplier. All fatalities related to Takata airbags, which can deploy too forcefully and shoot shrapnel at vehicle occupants, have occurred in Honda Motor Co. cars, and the devices have injured more than 100. Takata will continue to use ammonium nitrate as the propellant that inflates its airbags through a chemical reaction, Senior Vice President Hiroshi Shimizu said. The company has produced more than 200 million inflators that use the material, cited by at least one automaker as a cause for safety concern. Takada earlier told shareholders that an internal probe into why the inflators were failing was not progressing well, as millions of cars continue to be called back to replace the potentially deadly component. For the majority of the tens of millions of vehicles recalled, the root cause of why the inflators can fail has not been identified despite multiple investigations underway including those commissioned collectively by 10 automakers as well as an internal probe by Takata. "The analysis isn't progressing very well," Takada told shareholders, declining to speculate on when a conclusion would be reached. It was the first public appearance by the executive since the company's annual shareholders' meeting a year ago. At the annual general meeting, shareholders took Takada to task for his failure to appear in public to address the issue, the slow progress in resolving the crisis and the lack of a dividend. Shareholder Masahiro Yamazaki, 46, from Yamanashi prefecture, said the company’s president was unable to say when its investigation will be resolved. In response to a question about how he viewed his responsibility in the recall saga, Takada said he believed the best way forward was to carry on leading the company and see it through the crisis. He added he hoped to resume dividend payments "as soon as possible" once the crisis was resolved. 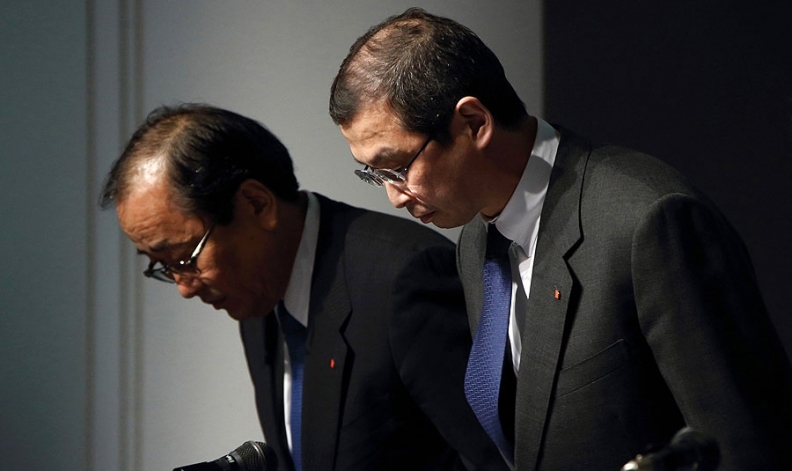 Shigehisa Takada, president of Takata Corp., right, and Hiroshi Shimizu, executive vice president, bow during a news conference in Tokyo today. Fiat Chrysler Automobiles NV said this week it is switching suppliers to replace driver-side airbag inflators made by Takata in more than 4 million recalled vehicles. The decision was related to choosing a safe chemical propellant instead of Takata’s ammonium nitrate, Scott Kunselman, FCA’s head of vehicle safety for North America, said Tuesday during a Senate hearing in Washington. Takata has fallen 38 percent in Tokyo trading in the last 12 months, while Japan’s benchmark Topix index gained 33 percent. Takada and his mother, Akiko, own about 5 percent of the Tokyo-based company’s shares. Another 52 percent is owned by TKJ KK, an investment firm that lists the family as board members. The airbag maker faced pressure earlier this week from U.S. Sen. Richard Blumenthal, D-Conn., to set up a victims’ compensation fund, similar to what General Motors established for people killed or injured due to faulty ignition switches in 2.56 million recalled cars. Blumenthal called for the company to respond to his request within two weeks.